ST4690 : The "Civitas Silurum Stone"
This stone appears to have been the base of a statue (now lost? ), and bears an important inscription which confirms the existence of the Civitas Silurum or the Romanized self-governing body of the Silures tribe. 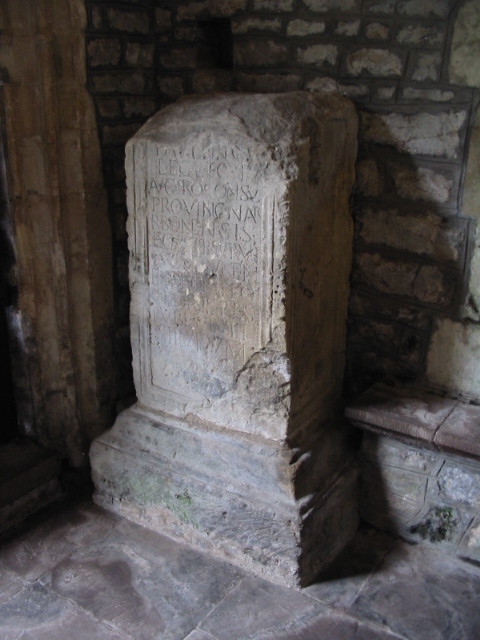 The so-called 'Civitas Silurum Stone' is now on display in Caerwent church. "For Tiberius Claudius Paulinus, legate of the Second Augustan Legion, proconsul of (Gallia) Narbonensis, imperial propraetorian legate of (Gallia) Lugdunensis. By decree of the ordines for public works on the tribal council of the Silures." © Copyright Nick Smith and licensed for reuse under this Creative Commons Licence. This page has been viewed about 238 times.